So, tomorrow we’re off to LonCon. We’ll be there through to late Sunday. I’m looking forward to it, and, also, for the first time during the Month of Cons, I find myself sincerely nervous. Normally I have about six months to get past a con and ready for the next one and, here, I’ve not quite had six days. Days in which I’ve started a new job, real progress has been made on where we’re living next, two new projects have fired up and I’ve got into a serious of increasingly surreal fights with a company who claim to run buses but who I think are actually just performance irritation artists. Oh and the latest Slingers volume, featuring some pretty chunky stuff for the fictional avatars of Marguerite and myself, is out. Like I say, big week. So with that in mind, I have two options. The first is to breathe in and out of a paper bag and try not to think about the crippling lack of confidence that sometimes still apathetically beats me up, even as it does in fact apathetically beat me up. The second is write about it and, in doing so, get it under control. This is going to be fun. 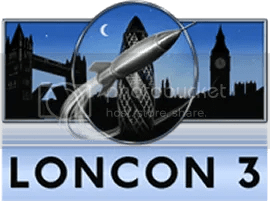 We’ve got a great story from a novelist who’s got a real presence at LonCon and it’s the first time we’ve done this live. The plan after that is to do a meetup for any Escape Artists fans, either at whatever coffee shop in the Excel isn’t crammed or at the nearby pub. We’ll have more details about that on the day. One of the things that’s really impressed me about LonCon already is the guidance for moderators. Like I said at the top, I’m a little nervous working on a stage this big but they’ve done a great job. It’s good, useful advice for any con too and the links all seem to be public so I’ve put them below. If any of them aren’t, and the owner would prefer them taken down, let me know at Alasdair Stuart and I’ll do that.